Queue and Kaan don't blame their soccer coach. In fact, they trust him with their lives, they said. Both boys, who go by their nicknames, had planned to go on the June 23 hike into Tham Luang Nang Non, Thailand's longest cave, which ended with 12 of their Wild Boars teammates and coach getting trapped inside by floodwaters. Queue, 13, didn't go because he had stayed up late watching a World Cup match, and Kaan, also 13, was sick. Otherwise, they'd also be stranded in the partly flooded cave. The boys, clad in their khaki school uniforms, told ABC News' Matt Gutman in an interview Friday that venturing into the cave is something of a local rite of passage, and that kind of team-building exercise is critical because they spend 15 to 20 hours a week together. Their 25-year-old coach had led them on many trips into the cave complex in mountainous Chiang Rai Province after soccer practice, they said. And if any of the boys didn't want to go, they'd wait for their parents to pick them up. ABC News' Matt Gutman speaks with the other members of the Wild Boars soccer team in Chiang Rai province, Thailand, July 6, 2018. Queue said he wouldn't even always tell his mother when he visited the cave, giving off the impression that the hike wasn't considered particularly dangerous. The coach would often give the boys a pep talk before entering the vast cave, which is about a 45-minute bike ride from their school. They would spend up to six hours inside. "We brought some food, water and lots of flashlights," Queue said. Their flashlights would sometimes go out after a few hours but Queue was never scared --even when it was pitch black and there were "many" bats -- because they were with their coach, he said. The boys would keep trekking, stopping occasionally to scribble their names or draw pictures on the cave's interior walls. Queue said he had visited the cave four times this year, always with their coach. They had traveled as far as 3 miles into its depths. But Queue said he'd never been during this time of year, Thailand's rainy season. As the 12 boys and their coach ventured into the cave June 23, the sky opened up and heavy rain flooded the cave, cutting off their exit route. The group forged ahead before finding a dry, elevated slope where they were stranded in total darkness. When the group never returned from the hike, Thai officials launched an extensive search-and-rescue operation involving more than 1,000 people, including specialists drafted from various nations such as Australia, China, Japan, the United Kingdom and the United States. Queue said Thai officials came to him and his other teammates for information about the cave, asking about which route they usually took and what the conditions were like inside. 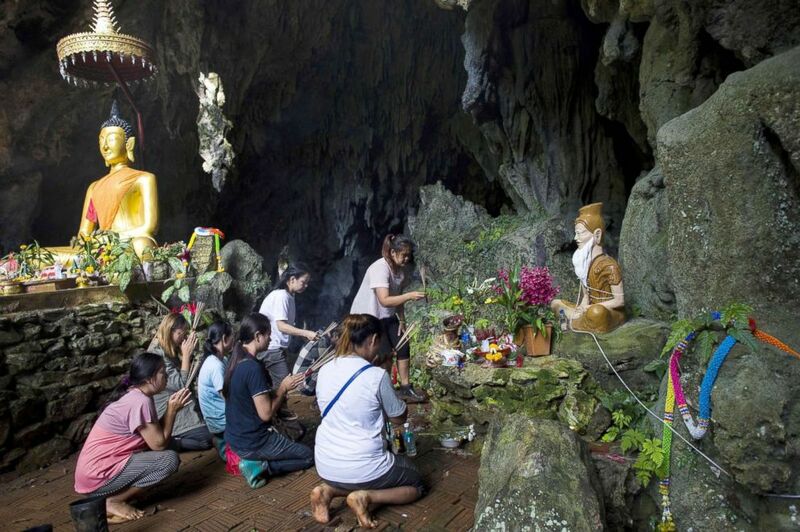 Family members pray before a shrine in Tham Luang cave area as operations continue for the 12 boys and their coach trapped at the cave at Khun Nam Nang Non Forest Park in the Mae Sai district of Chiang Rai province, July 5, 2018. On July 2, two British cave divers found all 13 alive in a chamber about 3 miles from the cave's main entrance. Queue said he wept upon hearing the good news. Rescuers are now working around the clock on a plan to extract them as safely, and quickly, as possible. Both Queue and Kaan said they trusted their coach to help keep their teammates calm as rescuers work on a plan to get them out. Their coach used to be a monk and had taught them how to meditate, the boys said. It's unclear exactly how and when rescuers will try to extract the group, and Thai officials have cautioned that it could take "weeks or months." But the weather conditions might not allow for that length of time, with heavy seasonal rains forecast to hit the region this weekend. ABC News' Aicha El Hammar and Scott Shulman contributed to this report.